New York City photographer Carmen Santorelli recently submitted this gorgeous shoot to us, and we fell in love! I adore the contrast of the soft muted tones against the metals and pops of vibrant color peeking through. And the setting is so unique! The overall feel of the shoot is just really nice, and the inspiration and fashion choices behind it are so cool. "The inspiration for this shoot was initially Grace Kelly," Santorelli said. "Although it ended up taking a more fiery, Mad Men inspired turn. My muse, Stella, wore some really special vintage outfits for the session. Some of the pieces had actually been hand sewn by her grandmother, a seamstress! 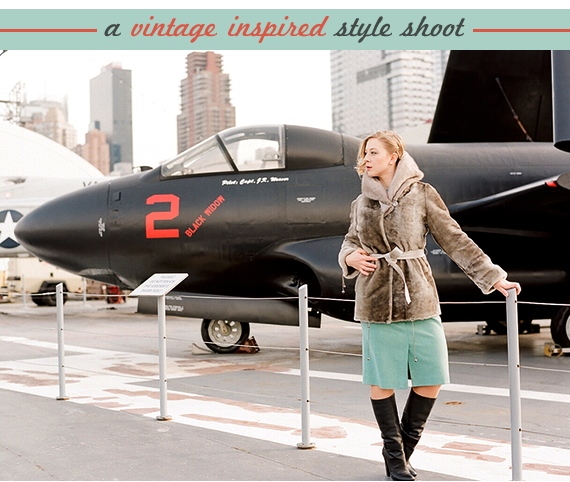 I chose the Intrepid Museum in NYC as our location to add that classic, romantic backdrop that reminds me of old war movies." The entire shoot was done with film, rather than digitally. Carmen made the conscious decision to use film in order to keep the vintage feel authentic: "All of the images were captured on film, to create that final touch of timeless beauty." We love it! You can view more of Carmen's work via her website, blog, and Facebook page. P.S. Do you have a photo session or project you'd like to submit to Bubby and Bean? Find out more info here. Love this shoot!! The blue dress is amazing!! So chic! Thank YOU for submitting them Carmen! Thrilled to showcase your talent here! Awesome! I love the theme and the sharpness of the photos. Beautiful pictures! I love the all the vintage dresses and the romantic theme of the photoshoot.